This book has Paper Panda’s very distinctive stamp on it and begins with a design section which takes the reader through a very personal account of what inspires her, how she works, and how Paper Panda came about. The techniques involved in papercutting are fairly simple and easy to explain, and this is covered through step-by-step demos. There is a design section, taking readers through the design process itself and including numerous examples of Louise’s papercut designs. Starting with the themes and subjects that inspire her, it explains how she creates finished artwork suitable for papercutting, followed by how to make the template itself, and how to use the papercut to make cards, framed pictures, and so on. The aim of this section will be not only to provide readers with an insight into Paper Panda’s creative world, but also to inform and inspire people to design papercuts for themselves. I've always appreciated beautiful papercuts, but having seen some again on TV over Xmas, I decided I would like to give it a go myself, especially since I already have a blade and cutting mat from prior crafting, so I bought this book to start me off. 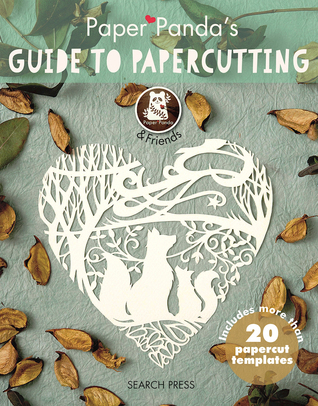 Paper Panda's Guide to Papercutting offers great advice for the novice papercutter, covering everything from technique to equipment. The book also provides some practice templates. Having now read through, I am excited to give it a go myself shortly!